Oskar Merikanto (1868-1924) was one of the most beloved Finnish composers whose works were often more accessible to the general public than those of his contemporary Jean Sibelius. 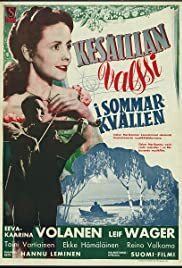 Perhaps because of this it was possible to build Hannu Leminen's music-driven drama film Kesäillan valssi from 1951 almost entirely around Merikanto's famous compositions, achieving great success among audiences all over the country. What we have here is not a biopic: the opening credits specify that the plot is not related to Merikanto's life at all and only utilizes his music throughout. The story is a variation of the old premise of love crossing all obstacles, this time set at the turn of the 20th century. Annina Grahn (the beautiful Eeva-Kaarina Volanen) is an upper class girl who falls in love with her handsome music teacher Lauri Alanko (the singing heartthrob Leif Wager) who responds to her feelings enthusiastically. Of course, her bourgeois family does not approve him due to his meager social status but Annina, having recently turned 21 and thus become an adult, is now old enough to make her own decisions. The first half of the film is so light in tone that it is difficult to see it as a serious drama at all because it so joyously cherishes the power of romance over anything else. Only during the latter half do dark clouds start gathering in Annina and Lauri's sky of love and the mood begins to develop into a melodrama before returning to a sentimental but kind of sweet ending. The unconvincingness of the dramatic elements can mostly be attributed to Eeva-Kaarina Volanen's performance in the lead role: her love-crazed, neverending smiling in practically all of the scenes does not fit in the serious moments and renders the movie more lightweight than it would otherwise be or was intended to be. Leif Wager, on the other hand, gets to demonstrate his acting talent in somewhat demanding scenes later into the film and handles the role well enough. I would also like to give a shoutout to the folksy Toini Vartiainen and Reino Valkama in supporting roles as Annina's friend Else and the couple's friendly protector Manu respectively. As mentioned, the film is largely based on Merikanto's music and it is because of this why it feels better than the storytelling alone would suggest. The eponymous waltz is heard several times throughout the film and why not, it is an iconic peace of Finnish culture after all. Other lovely tunes sung by the high-voiced Volanen and the softly crooning Wager include "Oi, muistatko vielä sen virren", "Onnelliset" and "Annina" – all beautiful melodies carrying an ambiance from times gone by. Shame about the less than satisfying sound quality on the print I saw! The story has not enough substance to work properly as a serious drama, so I think it may be better to see Kesäillan valssi as little more than romantic fluff from start to finish. As such it is very watchable and not to be missed by fans of classic love stories in Finnish cinema. In short, "pleasant, melodious, forgettable" is how I feel about the movie after seeing it for the first time.